It’s important for you to have a solid understanding of the IEPs you’re following and how to read them, the evaluation timelines in your state, and required documentation throughout the process. Read the regulations and ask questions. This knowledge will come in handy whatever district you work in. Whether you’ve started on a new team, or have dropped into a building to cover a leave, it is well worth your time to make an effort towards understanding the special education team in place. 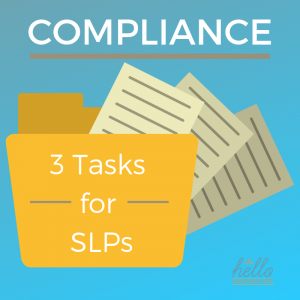 Although you might case manage the “speech-only” IEPs on your caseload, and thus be in charge of scheduling and evaluating, you likely share other cases with a team. Take some time to understand what that team needs from you and how they schedule their work. It will help you understand the in-process cases and be ready for upcoming work. The most important piece of maintaining and documenting compliance is clear communication with your team and administrators. If you feel like you’re having to make tough decisions (e.g. combining or canceling groups to complete evaluations, or abbreviating assessment to meet timelines), let your team and your administrator know. You might feel like this is exposing your weakness, but on the contrary, it allows you to be explicit about the priorities that are driving your decisions. If your team or administrator has different priorities, it falls to them to let you know! As always, it helps to plan ahead. If you have concerns about compliance – especially as the December 1 deadline approaches – be proactive about your planning and communication. It will pay off in the end!